I was looking for a decent speaker at a reasonable price. I searched several sites and ran across this company. I checked several reviews and thought I just might give them a try. Well I did, and could not believe the sound and the overall construction. I didn't mind the black finish because I wanted them to kind of blend in anyway. These speakers thump and the highs are crisp, I also bought the center channel,which adds a new dimension to my home theater system,contemplating the sub woofer now. I am the type of person who likes to test out many speakers. After owning many type of speakers out there like Polk, Klipsch, JBL and even higher end models like B&W, Kef,Definitve Technology, Athena, Paradigm. I was very impressed with Fluance.AV-938. The performance was really good and it only cost me less than 300 dollars. The mids are good, the highs are very clear and crisp and the lows are pretty decent not too deep,but it picks up. I would definitely recommend this speaker to anyone. Fluance is not a white van speaker company they are very legit and make some real speakers. Trust me on this!! They are almost comparable to my B&W 800 series speakers. Call me nuts or crazy,but Fluance is serious business for the buck. sound quality comparible to many of the brands that are two and three times more expensive. packaging...came double boxed, wrapped, and in foam, you can't ask for much better handling than that. Spent less than a thousand dollars on speakers that make my house a movie theater. center channel is a little weak, but it's worth the pricetag. other than that i don't have a complaint. Price, good mids and highs, quality, looks. Bass, crossover not set at best places, big and heavy. These speakers were purchased to be used in the inexpensive stereo setup in my bedroom. Initially I was not impressed by the sound, but I gave them time to break in and things got better. After about ten hours I analized the sound. The mids and highs are accurate and not exaggerated. When listening to vocals the speakers seem to vanish just leaving the sound. The quality of the higher frequency drivers seem to be very good for the cost of the speakers. What still does not impress me is the lower end of the speakers. The ten inch woofers do not push out as much low bass as I expected even though I have them bi-amped. The sound of the bass is murky and dark. I also think the crossovers on the woofers are way to high. If I was Fluance I would set the crossovers on the woofers at 150 hz put no crossovers on the 4" speakers and keep the tweeter where it is at. Nevertheless a sub kept at a low volume seems to keep me happy. The construction of the speaqkers is exceptional for the price. They are made of mdf, come with spikes, are bi-ampable, and come with high quality drivers. They are beautifull black monoliths a la 2001 space oddassy (Excuse my spelling). In all I think these speakers are great for the price but the bass section could be greatly improved. Kind of a dull black finish but its not so bad. This is the reason for the 4 star review, sound quality is a 5! I've seen a few bad reviews on these on other sites by people whom do not even own them nor have they listened to them. I used these for 9 or months. The price seems to good to be true, but for $180 I thought I could throw them away if they sucked. I looked at polk, klipsch, paradigm and others priced much higher. Now obviously they are not B&W or dynaudio or macintosh! What they are is better sound quality than similar Klipsch or polk speakers but for a fraction of the cost. Why spend $600 - $800 for less clarity and a smaller soundstage. Fluance makes a superb speaker at an unbelievable price. paradigm, much time in listening rooms with the speakers listed in the summary above. Incredible sound for the price. Nice looking appearance. Solid build. Just had to do this review. Bought these speakers over a year ago. Did the research and went ahead and purchased. I also read from others that these speakers shined when biwiring/biamping. I'm not that versed, so never bothered to do this. The speakers sounded ok, but nothing spectacular, although very good for the price. Well, today I read an article and simply biwired the speakers using the b output from the receiver for one of the connectors after removing the bridge pieces. I fired up the system and all I can say is....WHOA!!! Extremely impressive difference. These speakers need to be biwired or biamped to be truly appreciated. I'm now using these for my music on one of my systems. If you have a pair of these, you've got to take the time and do this! I got an entire Fluance speaker package and have the SM-938s as my main speakers. I am very happy with this purchase and have impressed a lot of people with way more expensive setups. These speakers do require a good break in period (20 hrs) in order to come to life. These are biwired speakers and should really be biwired if you want to get the sound that is meant to come from them. I have a pioneer VSX D914K receiver which has a neat little feature of passive subwoofer out (option to have back surround speakers as subs ;-) )which I used to complete the biwire..... WOW is all I have to say. This made the biggest difference in the world, they sounded good before but now they sound great! The bass is very deep and tight. The people saying that an additional sub is needed need to try altering there setups. Construction build and quality is great and the shipping packaging is top notch. Fluance customer service is OUTSTANDING! I cannot remember the last time, if ever, that I have dealt with a customer service rep as responsive and friendly as this. I would recommend getting yourself a set of fluance speakers before you go and waste your money on the CRAP they have at best buy or circuit city or any store of that caliber. Trust me, you will thank me once you get these speakers. Was very afraid that these were another "Theater Research" deal. I was pleasantly suprised. The cabinets are well braced, a bit of a hollow sond when you rap on the sides, but the other panesla re solid. The binding posts are vey robust and they are Biampable. They are fairly sensitive and I've had to adjust all my settings. They sound very good. For the money, they are an excellent buy. The low frequency crossover point is a bit high, but it seems to work. Great sound, tall enough to be at ear level, 5 way binding posts, fast delivery, great customer service, and these babies rock the house, too. Like a lot of people who are hearing of Fluance for the first time, I was more than a bit nervous about purchasing the 938's, despite the insanely great reviews that Fluance speakers have been getting. I'm happy to report however, that everything from customer service to shipping was wonderful (ordered on a Friday, had them on Tuesday), and any concerns I had about the 938's have all but disappeared. Admittedly, I've only been using them for a few days, but here are some things to remember. 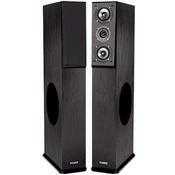 They resemble the monolith from "2001" so if you're not into monolith-like speaker design, you should look elsewhere. They're heavy and arrive double boxed, so they take some work to remove, position, and set up. Fluance describes the 10" side firing woofers as subwoofers, but don't be concerned about too much bass if you're using a powered sub in concert with these. The side firing woofers don't get down as low as a subwoofer. Think of them as what they are. A pair of passive woofers, only arranged to be side firing instead of front firing. I bi-wired mine, though depending on your belief system as regards bi-wiring, you can do so or not. I do recommend you go the extra few bucks and get the 12 gauge wire and bananna plugs. I was warned by a few naysayers that using my Sony 100w amp wouldn't be enough given those passive side firing woofers. Fluance told me there were no negatives to buying these speaks, but they'd perhaps be more than I needed for my intimate home theater. Nothing to worry about though as both sound great, and when pushed, they rock out with no distoration. There's a review from someone here saying they hiss, but ignore that, no hissing except from my cat who didn't like the bass response and was disappointed to find that these tall monoliths can't double as scratching posts. As massive towers go, you won't find a better bargain than these. VERY SOLIDLY BUILT. VERY GOOD LOOKING AND SOUNDING. AND OF COURSE, AN EXTREME VALUE.